Tera – What Comes After 65? So, the current level cap for Tera is 65. It used to be 60. What happened and what’s likely to happen next time and does that mean anything for how you might want to play this MMO or any other? When the “Fate of Arun” update happened, Blue Hole took a page from the Wow playbook. Briefly, this is what happened in the Pandaria expansion of Wow a few years ago: “A new threat has appeared on the horizon and we need to take a ship voyage to get there. The ship crashes and you begin a new journey on a distant land.” Sound familiar? In case you are new to Tera, this is exactly what you will see in Tera when you reach level 60 and then embark on the Sky Cruiser Endeavor. But What About My Gear? This is always the big question. What about my gear? Here’s what Wow did: You get new gear right away as you begin doing quests in the new expansion. Wow is the first place I saw an expansion of this type, so this may be an old trope from other games. But it certainly happened with Wow / Pandaria and with Tera / Fate of Arun. All that grinding for that sweet dungeon gear at level 60 that you spent the last year doing for all your toons – you have more than one, right? Well that’s all useless. Replaced with the same gear that any noob level 60 gets when they start the quest chain. Guild Wars 2 just came out with an expansion – Heart of Thorns. They did not increase the level cap – it’s still 80 – and did not require you to get new gear, although there will certainly be new gear available. GW2 concentrated on new “Specializations” which is to say that they are adding boat loads of new skills rather than a higher level cap and gear to match. Update 27 Dec 2015: This post describes an upcoming update, recently released to KTera . KTera is Korean Tera which gets updates from the Korean Blue Hole Studio developers about 6-9 months before the updates appear in North America. In this forthcoming update, Schisma gear – tier 7 PvE gear and currently one down from the top – will be given on completion of a new level 65 quest on the Island of Dawn. Up to now this gear has been very hard to obtain requiring many hours of grinding dungeons. I was not able to find a description of how hard this new quest was going to be to complete. Currently Idoneal gear, which is the lowest level 65 gear is given in a quest when one reaches level 65 and requires no work at all. I can imagine that some folks who worked very hard to get Schisma gear are pretty annoyed to be hearing that all that work was a waste and that now folks can get that gear with very little work. Of course, Masterworking Schisma gear to +12 will be just as expensive as it used to be. I’ve seen reports that it can easily take 200 scrolls to masterwork an item to +12. I’ll probably live with the much easier to accomplish +9 level of enchantment. But What is Tera Likely to Do? Tera is probably going to jack the level cap in a future expansion. So all that grinding for sweet dungeon gear is going to be just that. Grinding. It would be interesting if Tera [ Blue Hole Studios ] did something innovative, like allowing upgrades to your current gear rather than tossing it out, so at least you had the option of keeping that hard earned work. Maybe you would have the option to upgrade great gear to be a little better than noob gear in the new expansion so that your leveling would be a little better. But usually the gear level in the expansion rises so quickly that old gear is just trash. Or they could allow you to purchase a coin to turn your gear into a costume? Well, all the current fashion costumes are based on gear designs anyway, so there is probably a way to get that current look if you want it. Personally I’m going to put my time into other places. Mounts are cool. Some are easy. 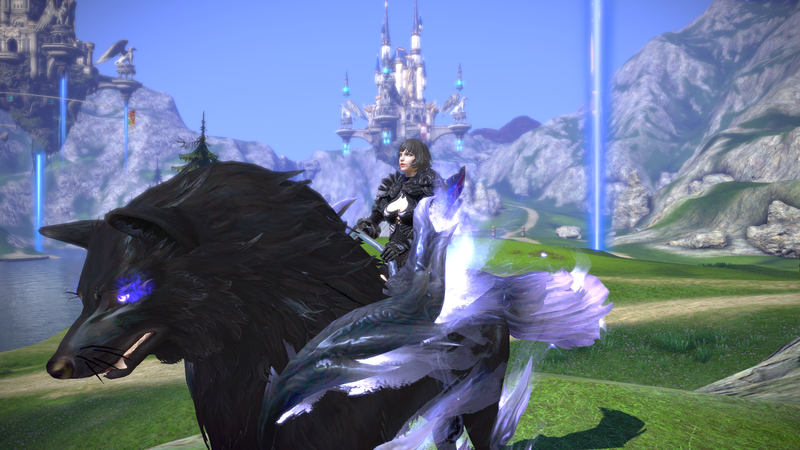 I had coins for my Wolf Mounts basically right out of the box for my Brawler when the Brawler event occurred. All my toons have the Sparky Raptor mount, which is a free mount from an achievement for visiting all the cities and monuments in the original game. And once you reach level 60 you can purchase a Death Charger for 350 Fed Bills. This is one of my favorites. 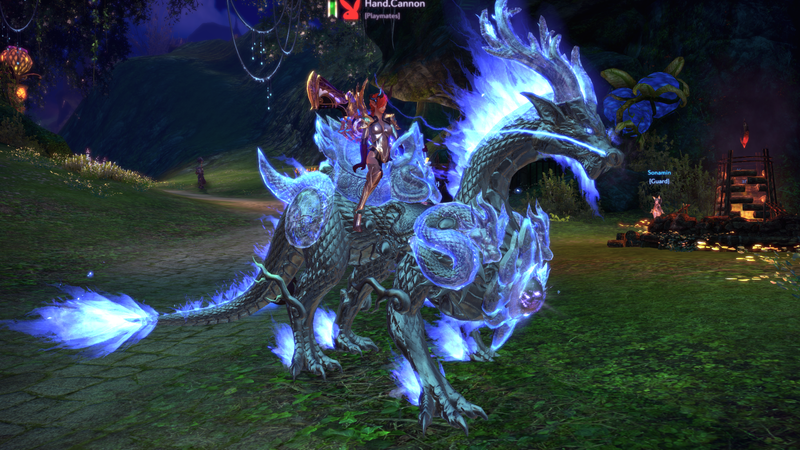 There are special event mounts like the misty dragon. Not my favorite. They are too bulky and ostentatious for my taste. But some mounts are a lot more work. This mount is a lot more work, and always will be. Even with high level toons, it takes many weeks to get one of these because you need to do Daily Quests to get them. I mentioned in the previous post my scheme for how I do it. Wow made all mounts account wide. 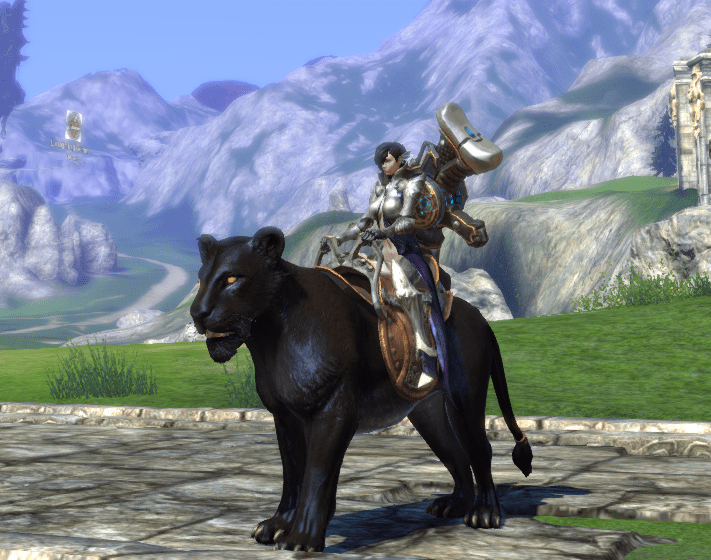 Currently all in-game earned mounts in Tera are soul bound – toon locked. Store mounts are optionally account wide. 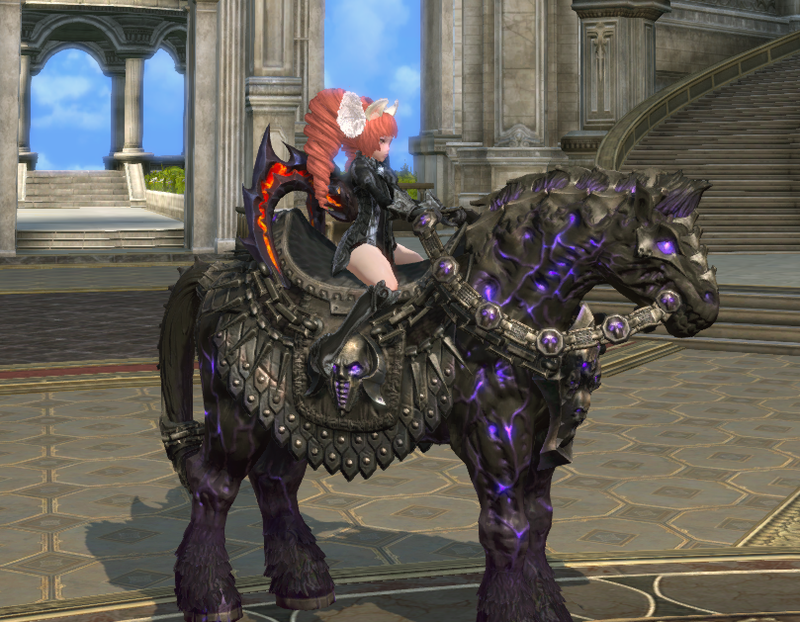 Purchase of mounts in the store is a great way to support Tera. An account wide mount costs about $24 and there are some very nice ones. Another place to put time, that won’t be obsolete in an expansion – we hope – are skins for armor and weapons. Tera already messed with costumes once. And we all hope they don’t do it again. Currently, we can save for costumes with Fed Bills – daily login rewards, 5 per day – and Fashion Coupons – drops and event rewards. Fed Bills can be turned into Fashion Coupons at a 1-1 rate. Then you can purchase weapon skins for 250 or 500, and armor skins from 100 – 600 Fashion Coupons. These are permanent skins. Another way to get nice skins is in battle grounds, and they are pretty easy to get in Corsairs. A few runs and you can get a skin for you and your new toon since the skin once purchased can be passed to a new toon on same account / server. Sweet. All my new toons start with armor skins right away. Oh yes, there are lots of skins in the store too. So, personally, I’ll leave the dungeon grinding for the coolest gear to others. PvP is not my thing, and the biggest numbers don’t mean much if in a few months those numbers are small compared with the noob gear in the new expansion. BTW, the gear power and damage numbers got so out of hand in WoW, that in the Warlords of Draenor expansion Blizzard did a “Stat Squish” to reduce the numbers from astronomical back to something more reasonable. Yes, Dorothy, exponential numbers eventually get very very large. Wow went back to a linear scale at higher levels. 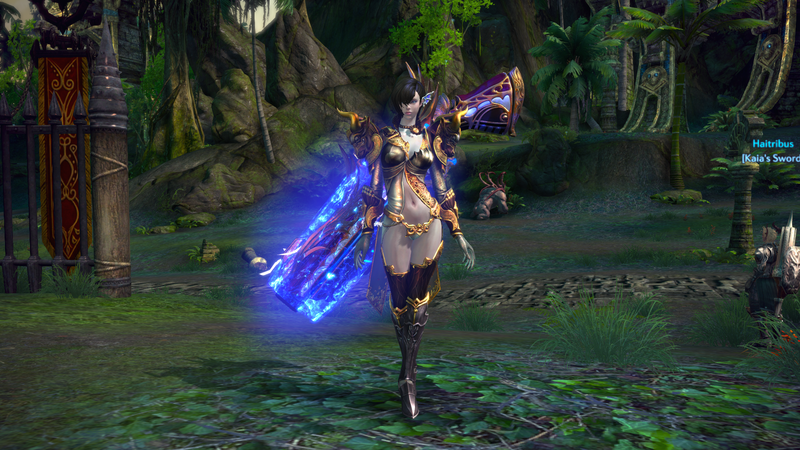 I like playing Tera and like to look good doing it.